Like most tea addicts, teacups are everywhere in Vivid HQ. Beverage usage aside, there is something totally consuming about their small but delicate shape. We often discover the prettiest cups whilst out thrifting — too good to leave behind even though we have so many already! Today I thought I would share a quick project with you to make use of those teacups that are too adorable to leave on the shelf. 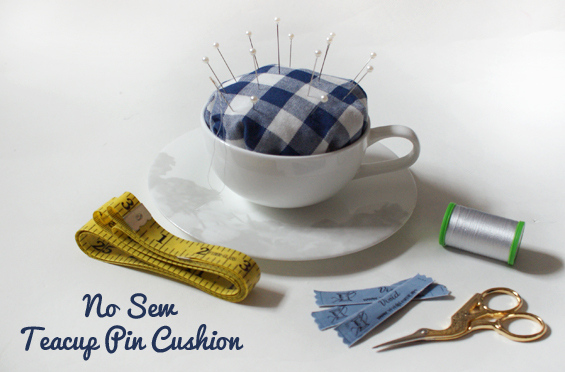 Say hello to the no teacup pin cushion! 1) All you need is a teacup, some soft toy stuffing, and a rectangular piece of fabric! 2) Lie your fabric flat and place your ball of stuffing in the middle. 3) Fold the shorter sides of the material to meet in the middle. 4) Tie a knot in the middle using the longer sides of the material. this is lovely, i made something similar recently using a clay candle holder once the candle had burned down. I hadn’t thought of using a tea cup but that’s a great idea! Thanks Crafty Green Poet! That sounds like a great up-cycle too 🙂 It’s so great when you can give something a new life! OOoh that looks so easy..think me and the littlies will do this…i have some tiny tea sets that they can make into pin cushions for themselves.